Korinna is a blue modern resume template. Three-column layout with a left sidebar in three shades of blue for your personal information. 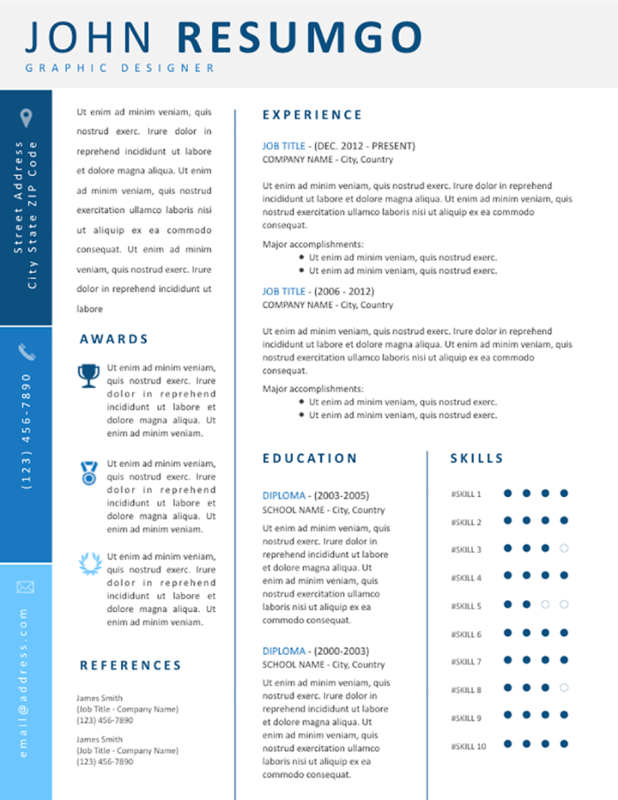 The three-column resume templates are not that common. This layout uses smartly all the space of your page, with a very well-balanced distribution of your content. A full-width header with a light gray background features your name and job title. On the left, 3 stacked vertical banners, with different blue colors, are used for your personal contact information – creating a nice modern look and feel. A left-hand sidebar showcases your personal statement or summary, awards (for example) and references (if any). The main body (on the right) features your work experience. And just below, two columns for your education (left) and skills (4-point dot scale).